Cucumbers have a cylindrical shape, a pale green and juicy flesh, and a green skin similar to the one of watermelons. They actually belong to the same family, along with zucchini and squashes. They have an impressive amount of water (about 96%) which is naturally distilled, and their skin contains high levels of vitamin A. This veggie is also a rich source of alkaline-forming minerals which prevent disease and bacteria. Cucumber is a great source of vitamin A and C, potassium, phosphorus, folate, manganese, molybdenum, silica, sulfur, and lesser amounts of vitamin B complex, sodium, and calcium. The presence of caffeic acid prevents water retention, and their topical application reduces puffy and swollen eyes. Cucumbers fight free radical damage and inflammation, and the presence of the potent polyphenol compounds naturally slows aging due to oxidative stress. 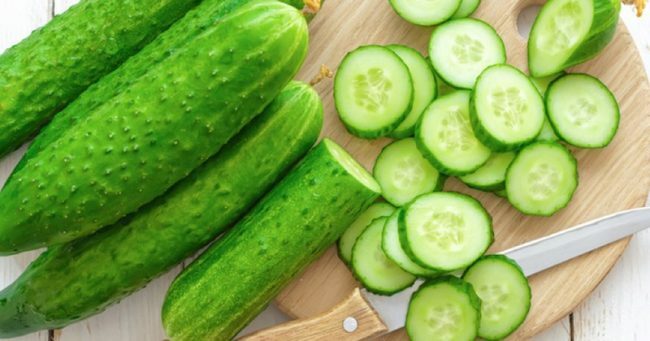 Researchers from the Institute of Pharmaceutical Sciences in Haryana, India, found that flavonoids and tannins in cucumbers might be responsible for free radical scavenging and analgesic effects. Therefore, the regular consumption of natural antioxidants from vegetables, fruit, tea, and herbs may lead to a shift in balance toward an ample antioxidant status. Cucumbers lower the uric acid levels in the joints and thus prevent inflammation and conditions like gout, arthritis, and asthma. The juice of cucumbers is a potent diuretic that eliminates waste through the urine and helps the dissolution of kidney stones. Cucumber juice is rich in alkaline minerals that regulate the pH of the blood and treats gastric and duodenal ulcers. This juice regulates blood pressure due to the minerals it contains. Rub cucumber juice on the sunburns to cool the area and soothe the skin. It fights water retention, as it supplies the body with the necessary electrolytes and restores hydration of the body cells. Cucumbers are high in silica that helps the proper construction of connective tissues in the body as in the bones, muscles, cartilage, ligaments, and tendons. Lie down, and place two slices of cucumber on the eyes for 10 minutes, to reduce the puffiness. Cucumbers are rich in vitamin C which improves skin health and helps in the treatment of skin conditions like eczema, psoriasis, acne, etc. Cucumber juice is rich in sulfur and silicon, which boost hair growth. You should always consume organic cucumbers. Otherwise, make sure you always peel their skin before consumption. To retain the freshness of the cucumbers, store them in the fridge, or if they have been cut, wrap them up or keep them in an air-tight container in the fridge.